A convict sentenced to life in the Cleveland zombie preserve takes a scientific interest in the undead. She went from standing there to loping towards them. That was one of the things about zombies. They didn’t lean. They didn’t anticipate. One minute they were standing there, the next minute they were running towards you. They didn’t lead with their eyes or their chins. They were never surprised. They just were. As inexorable as rain. She didn’t look as she ran, even though she was running through debris and rubble, placing her feet and sometimes barely leaping. McHugh’s zombies have some interesting nuances. For instance: It seems like you don’t really ever kill them, you just cut them down to little pieces and pile junk on them. Also they move in weird ways, and sometimes just stand still for hours until some unseen factor causes them to wander away. It’s precisely these behavioral peculiarities that fascinate loner exile Cahill, and inspire him to perform some experiments in the bombed-out urban wilderness of the zombie preserve. Things get pretty dark from there. I suppose “The Naturalist” coulda used a tough-love editor to trim it down a bit, but that doesn’t really matter. This is a twisted horror story, super tense and memorable in weird ways despite how thinly the genre’s been spread. 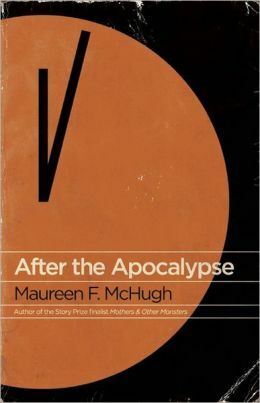 I’m looking forward to checking out some more stuff from this collection, which I purchased on a whim one day (sucker as I am, for apocalypse stories). Looks like you can read this story here.